AK-1000 is one of the largest tidal turbines ever created. Singapore Atlantis Resources Corporation is the name behind the AK-1000′s construction. The Tidal Turbine has a heavy duty design, weighing 130 tons and has an approximate standing tall of 70 feet. 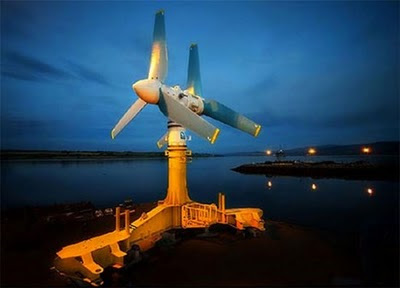 AK-1000 Tidal Turbine is installed to utilize the turbulent sea waves from the coast of Scotland and according to news released by Bloomberg, this AK-1000 tidal turbine is capable of supplying enough electricity to 1,000 homes in Scotland, generating approximately one full megawatt per hour. In case your country has many weavy shorelines and still arguing about not enough energy to supply your nation’s electricity, you should really question your government’s effort in fighting electricity shortage issues! !